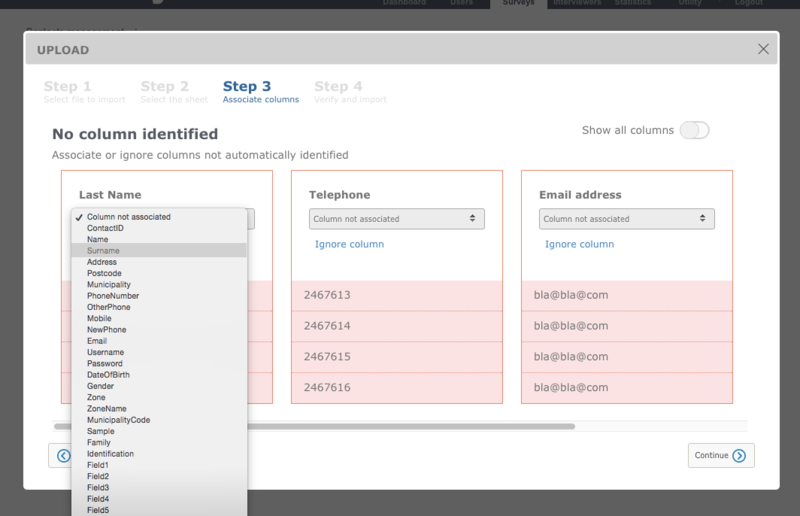 In IdSurvey 6 you can import your list of contacts much faster! In the “Contacts Management” section of the survey menu you can upload a list of contacts (respondents) to associate to your project. The list of contacts has to be imported with an Excel file. 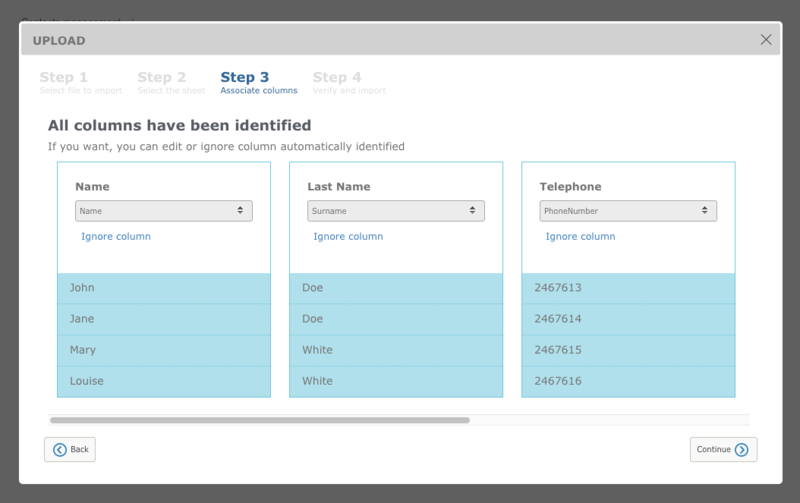 With IdSurvey 6 you don’t have to create the Excel file with IdSurvey column headers but you can associate your own columns with IdSurvey’s during importation. Enter “Contacts Management” section of “Management” of the survey menu. Click gearwheel button on top left then “Import”. STEP 1: click on “Upload” on top left in the upload window and select the Excel file from your computer. Click on “Insert” on bottom right. STEP 2: in this step you select the sheet containing your list. If the file you import has just one sheet, you’ll skip this step. 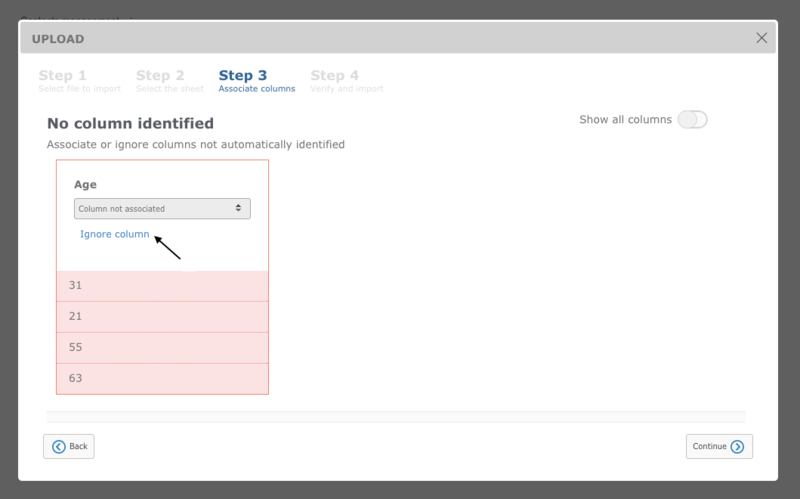 STEP 3: in this step you associate columns headers of your file to IdSurvey’s. By default IdSurvey will match columns with the same label (both for IdSurvey and your file) and you’ll display only columns not identified. If you want to display all columns click on “Show all columns” on top right. What you have to do is associate one by one columns of your file with IdSurvey ones clicking on the dropdown menu and choosing from the list. If you don’t want to import every column of your original file, you can click on “Ignore column”. Once you’ve matched all unidentified columns you’ll display a recap: blue columns are the ones you’ll import, grey columns are the ones ignored. If all is correct click on “Continue”. 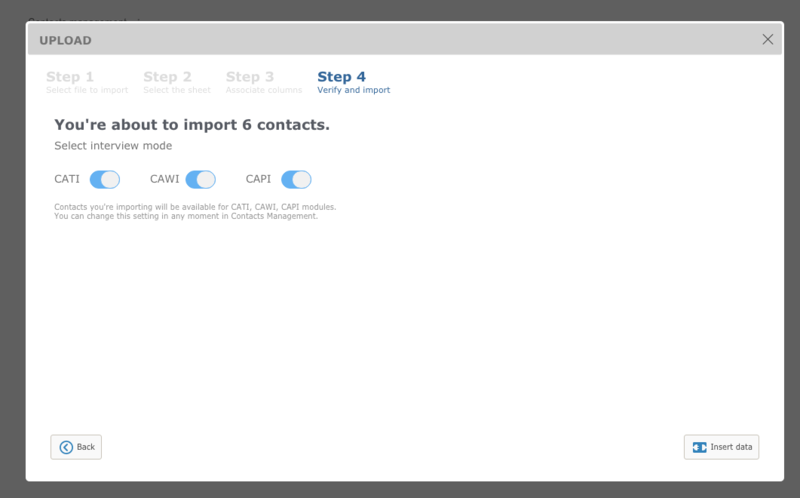 STEP 4: in this step you can associate your contacts to one, two or all methodologies! This action can also be changed later on in Contacts Management (click on the last icon of each contact “Actions” and select “Associate modules”). When all is done click on “Import data” on bottom right wait until 100% then close or upload another sheet.